My hand-knit and related stuff for sale, charity, family, etc. Been knitting on and off for about 50 years, sporadically trying to crochet, just bought a lucet. More details about my knitting, crochet and tunisian crochet can be seen at https://www.ravelry.com/people/Rosebark for which you need to be a member, but this is free. What happened to July, August and September? Lacy Cardigan - Cream:The yarn for this was bought some time ago from Allders which has since sadly closed!. I think they were selling it for £1/50g. The ball bands had been lost and it was bound in till receipt paper, so there was no clue as to what brand it is, but it feels like Sirdar Snuggly. 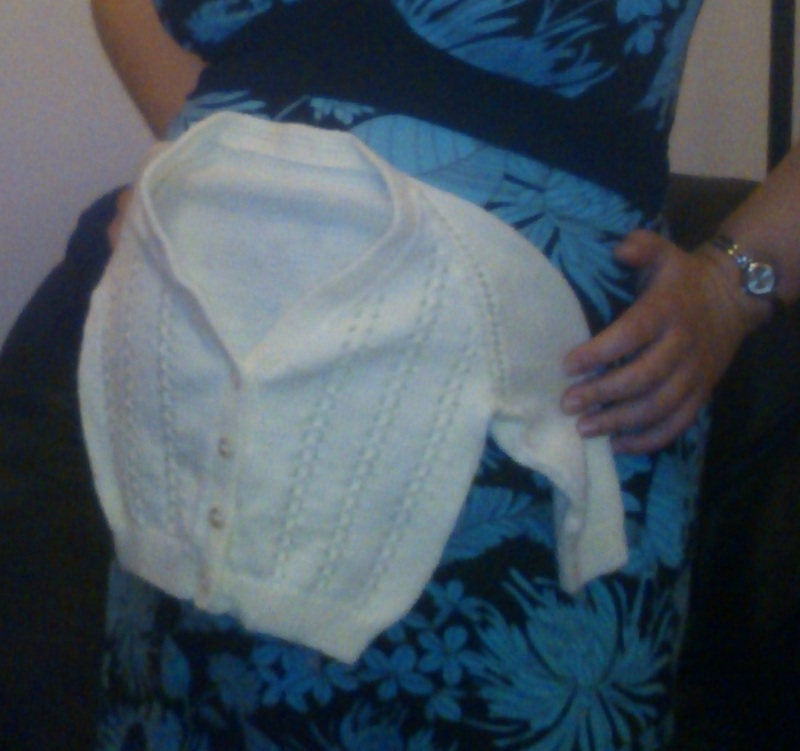 I decided to use it to make a cardigan for a band member/friend's 'Bump'. 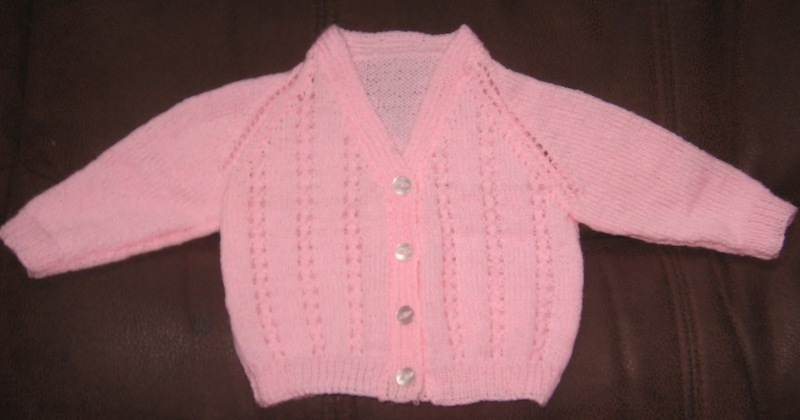 The pattern, which I had fairly recently got from ebay and not used before, is just called Cardigan. The instructions are for three sizes (19 to 21 inch) in three different yarns (3-ply, 4-ply and DK). I used 3-ply and followed the instructions for the smallest size, which I would estimate is a bit bigger than newborn size, which was fine for this one, as it will no doubt fit Bump at some stage. I was in a bit of a dilemma (or should it be trilemma if there are three possibilities?) about the buttons. The yarn is a sort of buttermilk/creamy colour and I have some buttons which are a very good match, but rather old and tatty, or somewhere I have some yellow buttons, which I think are a bit too yellow and the other possibility, which I went with in the end, was some white, slightly translucent buttons I got from ebay some time ago. Being translucent, they take on the colour underneath to some extent. The end result is shown on the left, as nearly as possible being worn by the baby it was knitted for. (Acknowledgment: this photo was taken by DD, who went to the shower held for the mother and handed it over for me). Lacy Cardigan - Pink I was quite pleased with the result of the cream one and decided to do one for the local hospital, as I hadn't done one for them in a while. 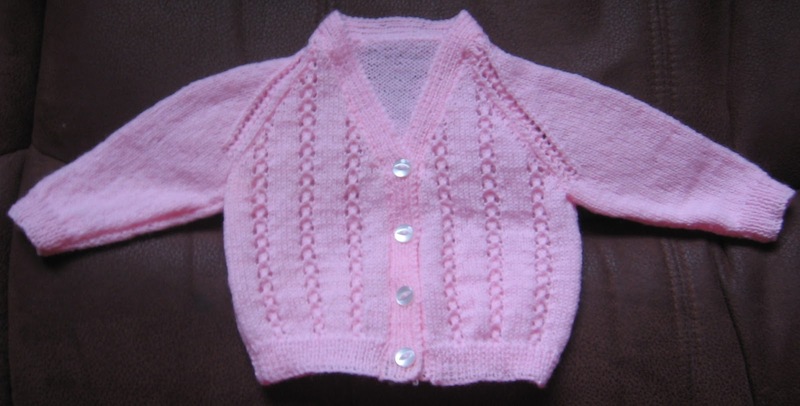 I used some pink 3-ply Robin yarn which was given to me by a member of the Croydon Knitting Group for the purpose of making cardigans for the hospital. I wanted to do this pattern again, however, as mentioned above, the smallest size instructions come up a bit bigger than newborn size, which is the size they want. So I decided to try to be a bit clever and knit using 3-ply yarn and the needles recommended for the 3-ply instructions in the pattern, but to follow the 4-ply instructions and make the parts all ½ and inch shorter. I used some more of the slightly translucent white buttons, as I don't have any pink ones, and the result is as on the right. Ideally the top button should be a row or two lower, but I think it turned out rather well for an experiment and I may well do a white or blue one the same soon. I took one photo with flash (above) and one without (below) and have included both as the flash one is the truer colour, but the non-flash one shows better detail. Bit of Technical Stuff - For those who are interested in the mechanics of knitting: I have used a slightly different technique for the decreasing on these ones. Usually you get k2tog on one side and k2tog tbl (or ssk or sl1, k1 passo) for the other side and I have always found that the K2tog tbl was never as neat as the k2tog. I have read various suggestions for rectifying this and not been satisfied with my results using them (not saying they don't work for other people). What occurred to me after much thought over some long period of time is that it's not so much the k2tog tbl that looks untidy, it's that the in-between rows don't lie in line with it like on the k2tog side. It is just the stitch on each previous row that is the problem, so I tried knitting just that stitch (on each relevant row) taking the yarn round the needle in the opposite direction from usual. I'm not sure if that makes sense and I don't really know how to show it with a drawing (plus being rather useless at drawing anyway). I suppose a video would do it, but I really don't want to get into that at present (maybe one day). Anyway for me it works pretty well. The k2tog tbl side is still not quite as neat as the k2tog side, but a great deal closer to it than I have ever achieved before and I will be using this method in future. Love these ...they are so cute. - Monochrome small bag/coin purse - now sent to Heartsease, would have to look into availability of similar clasp to make another. - Fluffy Scarves - two sold at craft fair on 10.12.11 then in November 2012 gave pink and green ones to charity, but can knit similar ones. As I have been caught out before by postage increasing, please ask for P&P details, stating where you would like me to post to and by what method (eg 1st or 2nd class in UK) and I will quote you an amount. This will be made up of the amount Royal Mail will charge me, plus a little for the packaging and my time taken packing and mailing the item.